A new series of study guides for young people based on the ERV translation. Designed to be used alongside the Authentic ERV Youth Bible. The Bible is packed with good advice on a whole host of subjects. This study helps the reader to learn how to hear God's voice and follow his plan for their life. It also looks at some of the hurdles that get in the way of following God and suggests practical things to do to make hearing God's voice and following him easier, especially when facing tough decisions. 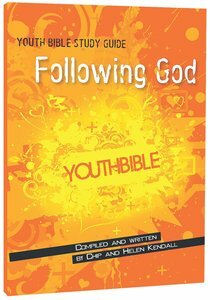 The Youth Bible Study Guide: Following God is one of a series of study guides for young people designed to be used alongside the Youth Bible, Easy-to-Read Version. It contains insights from a number of well-respected authors and has been compiled by Chip and Helen Kendall. About "Following God (ERV Text) (Youth Bible Study Guide Series)"